Supernatural collectible card game? Check. Cute, innocent female characters? Check. Depressing descent into a pit of despair where each revelation only makes everything worse? Double-check. Seriously, who knew an anime about young girls playing a children's card game could be so dark? 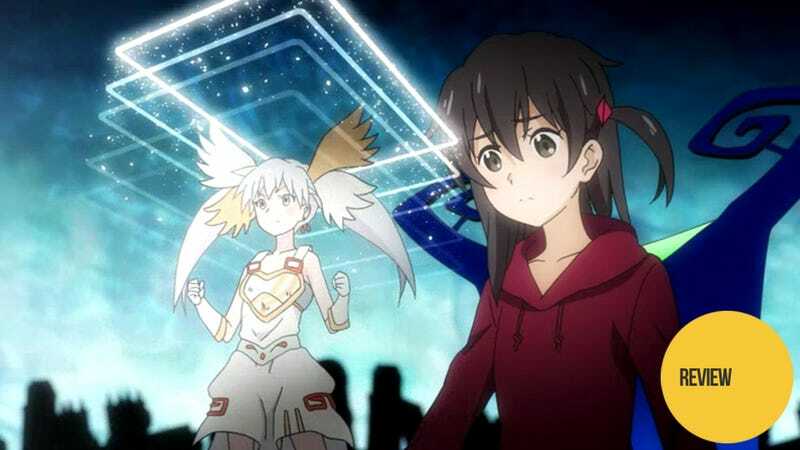 Selector Infected WIXOSS is the story of Ruko, a friendless orphan living with her grandmother. One day, her grandmother buys her a starter deck of the trading card game WIXOSS; and when Ruko opens the deck, one of the cards is very clearly alive—though it seems no one else is able to see or hear it. Soon Ruko learns that she is not the only young girl out there with a living card—and that having one has entered her into a supernatural competition as a “selector.” If she keeps winning matches, whatever she wishes for will be granted. However, if she loses three times, she is out and is stripped of all memories of playing the game as well. Given all that, it's no surprise that wishes are a key theme in this anime. These wishes go from the simple, such as making friends, to the taboo (becoming romantically involved with a twin). Some of the wishes are even malevolent and spiteful (making another girl fail at her chosen career). Ruko, however, is a special case. A life of abandonment has trained her to want nothing more than what she already has to avoid making waves. This means she simply has no wish. Of course, to the other girls in the competition, this makes her the ultimate blasphemer. Ruko is playing for no other reason than she enjoys the thrill of these card battles—even though she knows she is potentially denying these other girls their greatest wishes. This is where much of Ruko's inner conflict comes from. Battle is addictive to her and she knows she should stop playing, but she keeps getting drawn in regardless. And behind all that is the looming—potentially horrifying question—what would happen if a girl who wished for nothing got her wish? Win enough times, get your wish. Lose three times, lose your memories of playing. Seems harmless enough. I mean, who wouldn't want to be a selector and try for your dreams? Of course, as we find out over the course of the series, it is hardly that clear cut. The selector game is filled with hidden pitfalls and dark secrets—for both the losers and winners. That is the source of the “darkness” within this series. Following each reveal of the game's hidden rules, the characters struggle with the implications of said rules—how it affects them and those around them. Then they have to choose whether to continue playing or to give up. On top of that, most of these hidden rules are learned the hard way, meaning someone has to experience the suffering first hand. Simply put, WIXOSS is one of those series that appears cute and happy on the surface but quickly spirals down into an abyss of despair that the main characters have seemingly no chance of getting out of. For each step closer to victory, they only seem to sink further. WIXOSS is a real trading card game in Japan. I have no idea how to play it and the anime is in no way interested in teaching me. It seems that you have a hero character which you power up and use to attack the other player—and, in the case of the anime, these heroes are the talking cards. But really that's all I know. However, this is largely forgivable as the card battles are not the focus of the anime. Instead, it is the implications of the wishes and dark revelations that drive this series. The card battles are little more than an excuse to have two of the characters have a confrontation. What matters isn't the card game or how it's played, but rather the character development gained during such a clash and—of course—who wins or loses and what happens because of that. There are basically two main villains in WIXOSS, teenage idol Iona and the entity responsible for the whole selector game. Some time is spent developing Iona, yet despite this, her true motivations and ultimate goal are never explained. The game-creating entity gets far less development—only showing up in a handful of scenes to whisper corrupting words into vulnerable ears. This means that we never learn Iona's plan nor the purpose of the game. In fact, we don't even know if either “bad guy” really is evil. Their actions and the way the anime presents them suggests that they are, but even in the end we never receive the information we'd need to make that call. Presumably, those revelations are being reserved for the sequel series; but it's a bit hard to get fully invested in a conflict when you only know some of the stakes. As Modoka Magica is a dark twist on the magical girl genre, Selector Infected WIXOSS is a dark twist on the card battle genre. It takes a lighthearted setting we have seen numerous times before and makes it into an emotional ocean of despair. The card battles are nothing more than a catalyst to keep the plot moving by exposing each subsequent dark revelation. If you like psychological anime or “deal with the devil” type stories, this one is certainly worth your time. Selector Infected WIXOSS aired on Tokyo MX in Japan. It is currently available for free and with English subtitles in the US on Funimation and Hulu (and Crunchyroll in various other countries). The sequel series, Selector Spread WIXOSS is scheduled to air this fall.